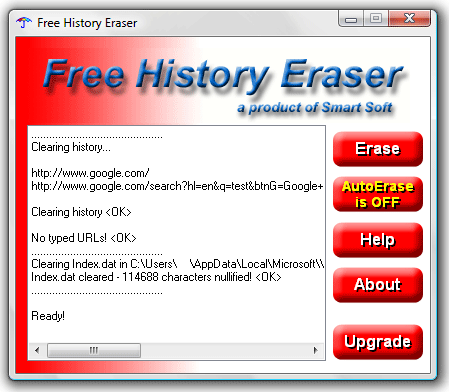 Free History Eraser is a utility that can be used to clear typed searches and securely remove traces of your internet activity. With a single click, this tool will delete or erase the Internet History or the typed urls, address bar AutoComplete and index.dat files in an attempt to prevent others from telling where you have been on the internet. History Eraser will run on any Windows Computer and can be run portably from a USB device as well. Note: You can uninstall History Eraser from your PC, once you have a copy of HistoryEraser.exe on your portable device.